Forget the useless, though wildly popular and entertaining, apps that previously filled up our smartphones or computers. People now want apps with function and purpose. 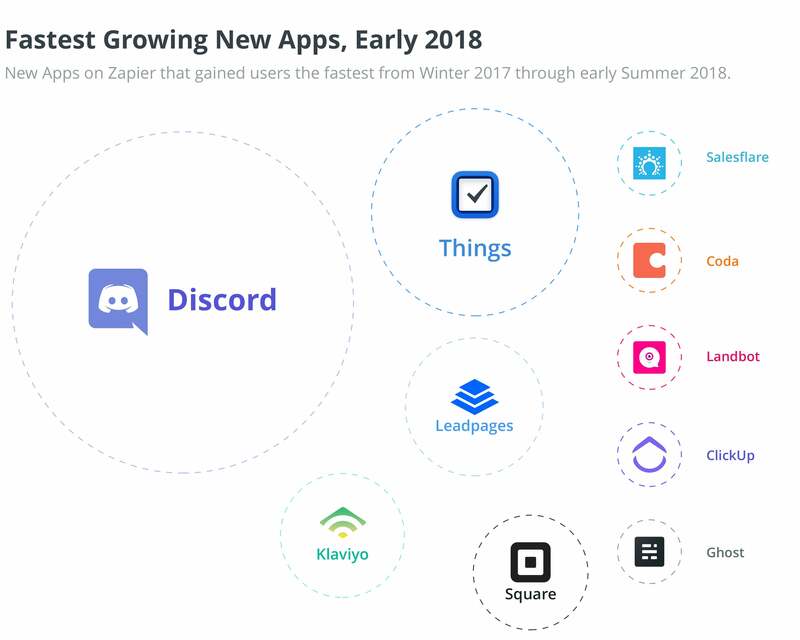 Here are the fastest-growing new or recently redesigned apps of 2018, according to business app platform Zapier, which compiled the data using its platform. Nostalgic for the days you stayed up late playing The Sims and messaging with your friends? Discord is a voice and text chat app that connects more than 14 million daily players in the gaming community through video and audio. If you need help organizing your busy schedule but don’t have a personal assistant, check out Things 3. This award-winning personal task manager app can help you get things done and achieve your goals in an organized manner. Not your typical email marketing service, Leadpages helps you create customized landing pages, webinars and ads to generate leads. It focuses on growing your email list, then links to a third-party site, such as MailChimp, to send your campaigns to those that signed up. Klayivo pulls in data from your ecommerce platform, point-of-sale software or other marketing tools and helps you create highly targeted and super-relevant email, Facebook and Instagram marketing. You can set up automated trigger emails for when customers sign up, abandon shopping carts and check out. Square handles all of your company’s digital finances. With four different platforms (Payments, Point of Sale, Payroll and Capital), Square helps you track all of your money on your smart device. Compatible with both Apple and Android, you can make customer transactions, pay employees and fund your company. If you feel like you waste too much time updating your CRM, Salesflare is for you. A CRM that basically fills out itself, Salesflare inputs data for you so you can focus on making sales. It reminds you what follow-ups are the most important and who talked to what customer, so your team can efficiently work together to increase profit. If you want to build your own website instead of relying on Squarespace or Weebly, Coda lets you hand-code with a little help. It edits your text to make sure your coding is in tip-top shape. Landbot creates a Chatbot for you within minutes that lives in your website and enhances your customer’s experiences. A modern-publishing toolbox, Ghost helps you create and manage an online blog or publication. It edits, manages content, schedules, builds proper SEO and more, all through its simple platform.